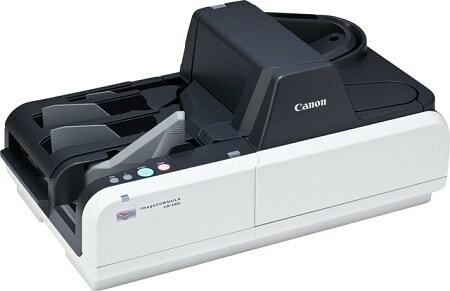 The Canon CR-190i Check Scanner is the cornerstone for production check processing, delivering high performance, reliability and image quality. With an efficient countertop design, the Canon CR-190i Check Scanner is capable of meeting even the toughest challenges. The Canon CR-190i Check Scanner can help financial institutions, utilities, and other organizations that handle large volumes of checks improve the efficiency of payment processes and treasury management. This results in faster access to funds, reduced costs and increased ROI. The features offered by this check transport are ideal for high-volume remittance processing, lockbox and back-office/branch capture. High speed scanning: The CR-190i can scan up to 190 checks per minute. Versatile document handling: The CR-190i can handle items such as business and personal checks, rebate check cards (and other thicker documents), deposit and withdrawal slips, coupons, tickets and envelopes. Built-in Jogger: With redesigned rollers, the jogger helps ensure proper document alignment and to eliminate misfeeds. Optimized MICR algorithm: New algorithm in order to achieve more accurate MICR reading. MICR data complemented with OCR processing: MICR data is not only read by the MICR reader but also employing OCR. Both results are processed by the CR-190i's new algorithm. Ultrasonic Double Feed Detection: More accurately monitor documents for double feeds to ensure scanning dependability. Improved OCR accuracy: 1,200 DPI optical resolution, fine print and small details can be captured with exceptional clarity. Sharper images with less distortion: Up to 300 DPI output resolution helps guaranty that valuable check information can be reproduced with utmost precision. Countertop Convenience: The CR-190i check tranport's compact, robust design and easy access allows this device to fit into even the busiest environments.